at the back of C.P. Sta. Teresa Elementary School. Finally, Republic Act no. 3845 was passed by House of Representatives and Senate on October 9,1999 and June 8, 2000 respectively. 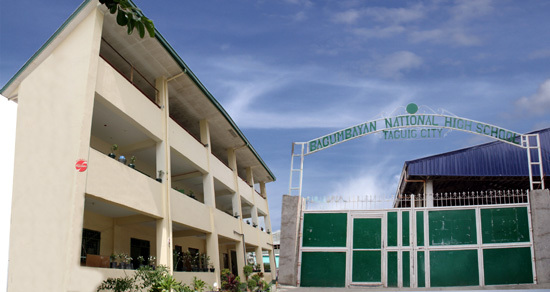 Two years after the approval of said act, Bagumbayan National High School opened its door to the students in June 2002 with 485 freshmen, 6 teachers and 5 makeshift classrooms located in C.P. Sta. Teresa Elementary School. At present, Bagumbayan National High School has 25 classrooms with a 3-storey 9 classroom building under construction. There are almost 4,000 students enrolled this SY 2011-2012 being handled by strong teaching force of 98 faculty members. The school is under the leadership of Dr. Noemi O. Bayle (principal). Location: M.L. Quezon St. Bagumbayan, Taguig City. Bagumbayan Elementary School started in the year 1920 with only two rooms in the old house of the Sta. Teresa Family. Mrs. Sta. Teresa seeks the help of Amang Rodriguez Sr. to build additional rooms, with the help of the Municipal Government. The Bagumbayan Elementary School was improved and became a real public school in the community. Most of the teachers were from Pateros and Taguig. Considering the achievement attained by the intended honoree, the late Col. Cipriano P. Sta. Teresa can be considered as one among the compendium of the best in the field of civic work and nation building. But for greater significance for the young people and succeeding generation to emulate is his all consuming love and symphaty for the poorest among the poor when he, with sheer patience and determination, convinced prominent citizens and lot owners in the community to donate portion of their lands where now the Bagumbayan Elementary School stands. It was last September 15, 1995 when the renaming of Bagumbayan Elementary School to that of Cipriano P. Sta. 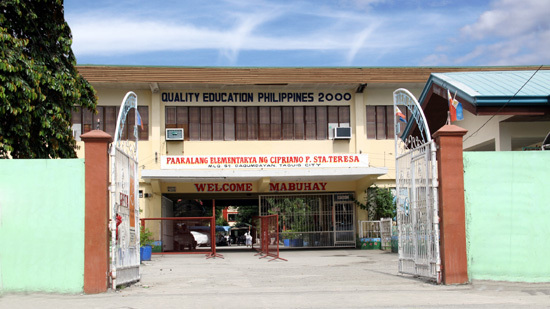 Teresa Elementary School, was made and the inauguration of which was held at Bagumbayan, Taguig last September 26, 1995. Location: Purok 3, M.L. Quezon St. Bagumbayan, Taguig City. 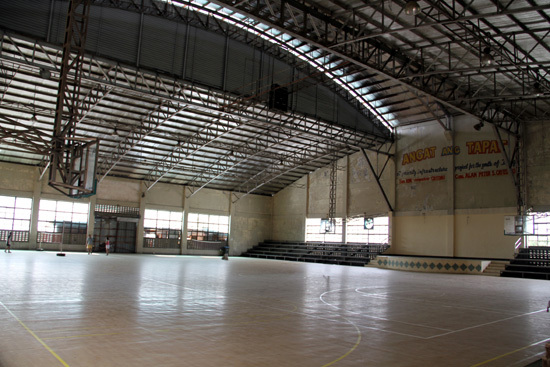 This sports complex was established during the term of then Congressman Alan Peter Cayetano. 1800 – The first chapel was established at Wawa. 1876 – It was transferred in its present location to the land donated by Mrs. Agatona Sta. Teresa. 1896 – The fire razed the chapel and nothing remained because of the Spanish war. St. Joseph and Sto. Niño at Paco, Manila. Mrs. Paula Ignacio bought the Holy Mary at Paete, Laguna. 1969 with a blessing from bishop Bienvenido M. Lopez. Location: Holy Family Village, Bagumbayan, Taguig City. Tel. No: 837-0771 / 838-8305. 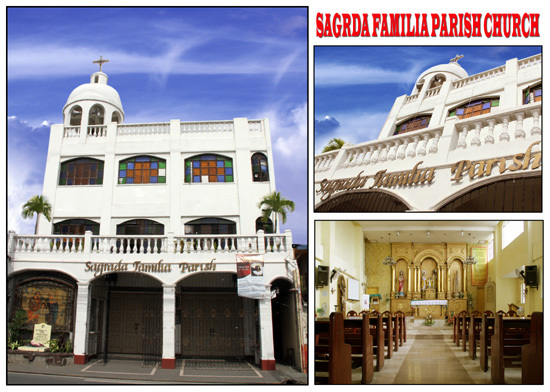 Saint Francis of Assisi College had its beginnings in 1981, when the husband and wife team of Dr. Evangeline Oñas-Orosco and Dr. Arturo Agapito Orosco, opened a two-classroom preparatory school in Talon III Las Piñas City, to provide affordable quality education for young children. By 1983, the schoo’ls popularity was such that two-storey, full elementary school building had to be constructed to meet the surrounding community needs. The opening of the high school department quickly followed in 1986, assuring placements for SFAC graduates in the secondary level. At the same time, two new campuses were established, one in Taguig City, and one in Los Baños, Laguna. In 1989, the tertiary level in SFAC came into being offering several courses both in degree and non-degree programs. New campuses have since been added: the Pamplona, Las Piñas campus in 1990, the Bacoor, Cavite campus in 1994, the Alabang, Muntinlupa campus in 1996. In the same year, 1996, Saint Anthony School of Las Piñas came under SFAC supervision and management. 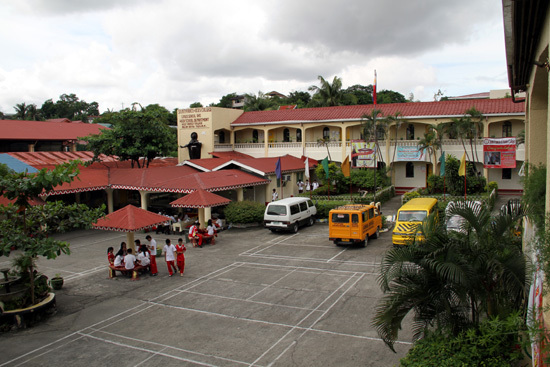 Dasmariñas, Cavite campus opened in 1999. The newest campus in Biñan, Laguna opened in 2006.